On July 29 Microsoft launched the general availability of Windows 10. During the months leading up to this date, the development team at Vesigo Studios worked closely with Microsoft engineers to ensure that every feature of OnTime 360 would work flawlessly on Windows 10 when it was made available to the public. This means that users of OnTime 360 can upgrade their PCs and tablets to Windows 10 today with the confidence that OnTime will continue to function in the way users expect. Windows 10 makes the OnTime experience even better on tablets. This opens up the possibility of field personnel using the OnTime Management Suite and OnTime Dispatch apps while out of the office and in the field. Features such as remote dispatching and mobile thermal label printing empower those workers in the field. OnTime’s exclusive built in smart client technology enable those tablet workers to continue using the programs even when connection to the internet is unreliable. 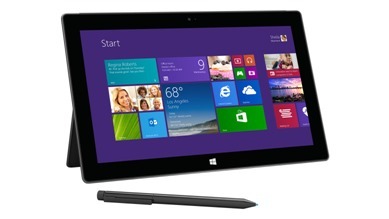 OnTime has been optimized to work smoothly even on budget tablets costing less than $100, such as the HP Stream 7 tablet. Users of OnTime will continue to enjoy new features and compatibility with new technologies at no additional cost. OnTime has always been updated to take advantage of new technologies in hardware and software without charging for upgrades. We are excited to offer Windows 10 support to our customers of OnTime today along with the promise of additional great features in the months ahead. 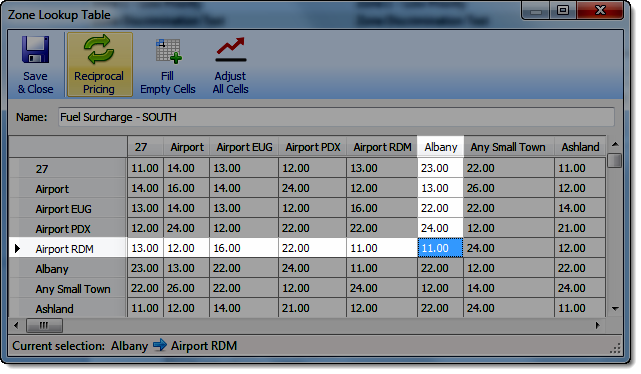 OnTime price set schedules can help you manage complex price structures and speed up order entry. Customize the availability of your service levels, or price sets, with OnTime’s price set schedules. If an order is placed during a time that is outside of your schedule’s defined times, the associated price set will not be visible or selectable from your Customer Web Portal or OnTime Dispatch order entry screens. Pricing specials that occur weekly or on specific dates, such as holiday discounts, can be easily defined and automatically implemented with price set schedules. A due date offset can be optionally defined with price set schedules. This offset will determine the expected amount of time between order placement and order delivery. For example, the shipment will be delivered by 11 AM on the next business day. With this tool, you can input guaranteed delivery times for your dispatchers and customers to reference. Organize your pricing structure automatically in OnTime with preferences and settings that you control. See Step 4: Configure Pricing in Chapter Two of the OnTime User Guide for detailed information about setting up your price set schedules. The 14 day OnTime courier software trial is available to anyone looking to evaluate OnTime in their environment. This trial version offers full online access to Enterprise subscription level features. Account sign up and set up have been streamlined to ensure that new accounts are usable immediately upon purchase. Your new trial is fully online and usable as an Enterprise account for 14 days. That means your trial account can access and use features including the OnTime Customer Web Portal, OnTime Mobile, the Report Designer, and QuickBooks integration. Everything that is included in a subscribed Enterprise account is included in a new trial account, with the exception of support from the OnTime Client Services team. Support resources available to trial users include the OnTime Sales team, the OnTime User Guide, and the OnTime Knowledge Base. Throughout your trial period, we will email you useful and informative links to help guide you. Note: If you are currently using the previously offered offline OnTime Trial, access will continue to be available for a limited time. We recommend that you sign up for this new trial for the best trial experience. The new trial is limited to 14 days of use; be sure to sign up when you are ready to test. To begin your trial, enter the required information: your name, contact information, and a chosen Company ID. Your new account will be automatically and immediately created on our servers. You can activate account subscription at any time during the trial period by clicking the purchasing link in the yellow bar at the top of your OnTime Management Suite or by following the activation link emailed to you. If you are considering purchasing OnTime for your courier business, our new trial will provide you with the most thorough testing environment. See how OnTime can work with you and your employees to make your company better: sign up for the new online 14 day OnTime Trial today. If you are already an OnTime user, refer a new subscriber to gain an account credit. In courier businesses, prices often need to vary from shipment to shipment based on a variety of diverse factors. Seamlessly group your price modifiers in OnTime to automatically calculate your prices quickly and correctly, every time. Grouping price modifiers allows you to make your pricing structure as complex as you need, while still providing a clean list of options for your customers. 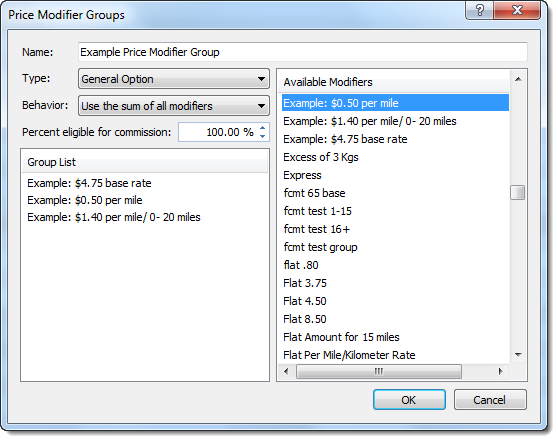 The highest, lowest, or summed value of a group of modifiers can be used to represent one charge in your prices. To create more advanced calculations, groups may be placed within groups. 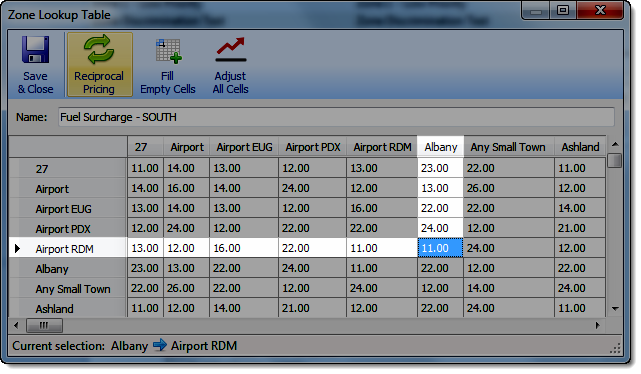 A price modifier group can be made available as a single service level option in OnTime. Using your OnTime Customer Web Portal or the OnTime Dispatch application, your customers and dispatchers will be able to enter order information and select the appropriate service level. OnTime will use the order information entered with your price modifier groups to automatically calculate the accurate price. To link the modifiers in your groups to a Price Set, only the group, not the individual price modifiers, must be linked. Additionally, when updating pricing based on one or a few factors, you only need to change the specific modifiers that contain those factors. All associated price modifier groups will be automatically updated accordingly by OnTime. 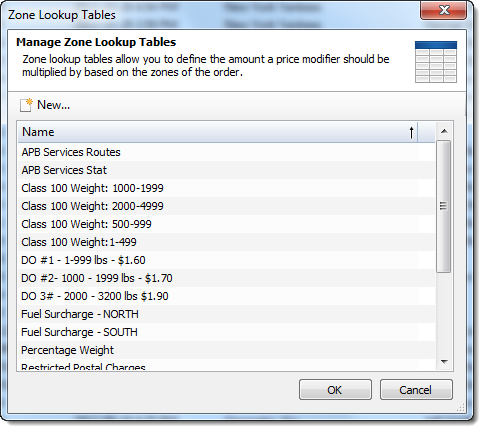 Create and maintain your versatile pricing structure using price modifier groups in OnTime. Learn how to create price modifier groups in our tutorial video, or find out more in the OnTime User Guide. As discussed in our last post, day-to-day organization within courier companies can be a challenge. To achieve the organization that your delivery business needs, dispatching must be seamlessly flexible and efficient. That efficiency and flexibility can be attained with the OnTime Tracking view’s customizations and functions. By default, OnTime’s Tracking view displays all information pertaining to your orders. Because a lot of specific information needs to be accessed quickly when dispatching, customizations can be made to show what you need, when you need it. You can adjust which columns appear and group those columns from the Tracking view. Deeper customization can be achieved by using the Tracking view’s Quick Views and Advanced Search functions. An array of actions, including several dispatching actions, can be accessed and executed by right-clicking on any order in the Tracking view. Dispatching actions that are available from the Tracking view include driver assignments, route assignments, and order status changes. 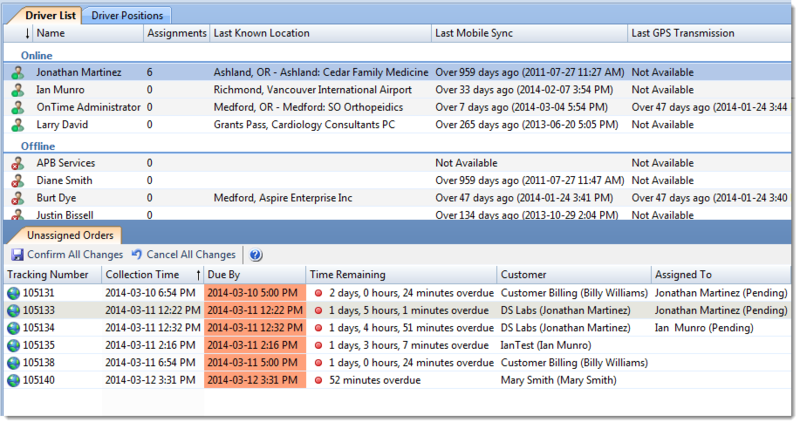 Other actions include CSV file exports, event triggers, report generation, and Tracking view adjustments. All of these actions are available in one view to optimize your day-to-day efficiency. 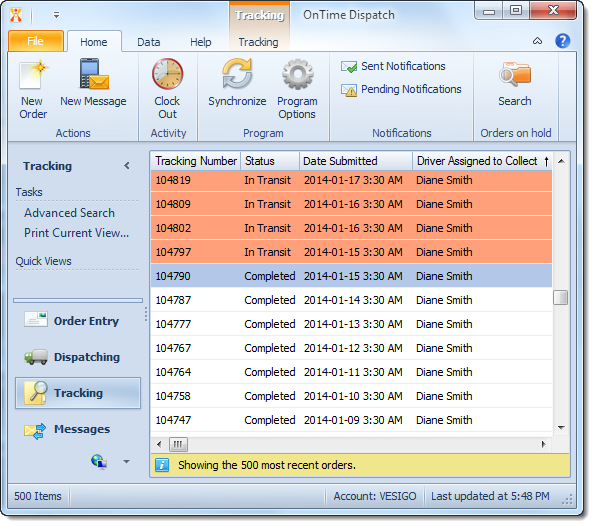 The Tracking view is available from both the OnTime Management Suite and OnTime Dispatch applications. Learn more about dispatching from the Tracking view in the OnTime User Guide, or signup for the OnTime trial version. Tell us what you think of the Tracking view @OnTimeSoftware or at Facebook.com/OnTimeDeliverySystem. Between dispatchers, drivers, orders, customers, locations, vehicles, and reports keeping your courier company organized on a day-to-day basis can be a challenge. When new and varying orders are constant, predicting where drivers will be, when they will be there, and when order locations will match up with driver locations is virtually impossible. OnTime courier dispatch software and its Unassigned Queue can facilitate organized order assignments in difficult to prepare for situations. Unassigned orders can be submitted into the Unassigned Queue and distributed to the right drivers at the right times. By using the Unassigned Queue, dispatchers can focus on order entry, not order assignments, when placing orders. 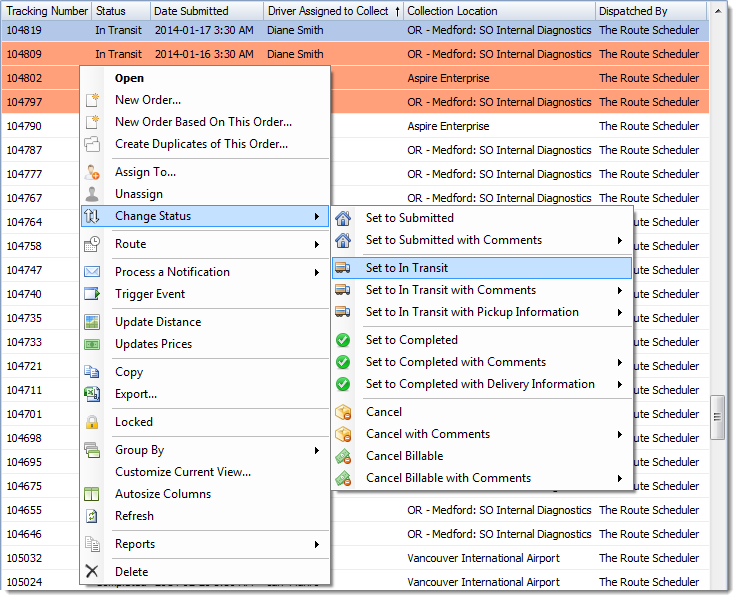 An Unassigned Orders list and a Driver List appear in the Dispatching section of the OnTime Dispatch program. In this section, order information can be compared against your driver locations and assignments. Dispatchers can use these lists to determine, make, and confirm order assignments individually or in bulk. Based on individual Employee Mobile settings, drivers can accept order assignments from the Unassigned Queue using the OnTime Mobile application. Allowing drivers to take part in the process of distributing unassigned orders ensures that order assignment considers all related factors. Orders entered through your OnTime Customer Web Portal will be placed in the Unassigned Queue, as well. Once a customer inputs their order, a dispatcher or driver can make the appropriate order assignment. In some situations, a customer can place an order and your driver can complete that order without any dispatcher involvement. The Workflow Designer in OnTime Management Suite can be used to setup notifications that will inform the appropriate people when an order is placed in the Unassigned Queue. With these notifications, dispatchers can be informed that they should make assignments for these orders and drivers can be prompted to accept the orders. OnTime and its Unassigned Queue can help your employees make informed decisions on a day-to-day basis, satisfying your customers’ and your business’s versatile needs. Learn more about the Unassigned Queue in the OnTime User Guide, or contact us today. The portability, convenience, and array of available applications available for tablets have made them a popular device among many courier businesses. 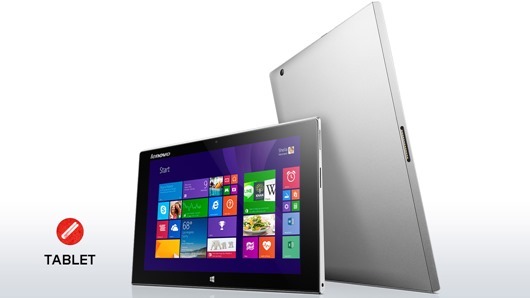 OnTime courier software and its applications are compatible with most tablet types. Review the information in this post to determine how you can use your tablet to access the OnTime features and functions that you need. The OnTime Mobile application offers an array of features for drivers, such as tracking and messaging. The mobile application is compatible with essentially all tablet types, including iOS (iPad), Android, Windows 8, and Windows RT. All of the features that are made available to drivers in OnTime Mobile on their phones will be functional on their tablets, as well. The OnTime Mobile application will adapt to high dpi displays, such as retina displays, ensuring that the application looks and performs in the best way on each device. Click here for more information about the OnTime Mobile application. OnTime’s desktop applications, OnTime Management Suite and OnTime Dispatch, provide features tailored to managers and dispatchers, respectively. Both applications require the Windows operating system. Note: Tablets running Windows RT will not work. Windows RT is a version of Windows that does not support desktop applications, such as OnTime Management Suite and OnTime Dispatch. Using these applications on tablets can allow management and dispatching functions to be executed from the field, as needed. 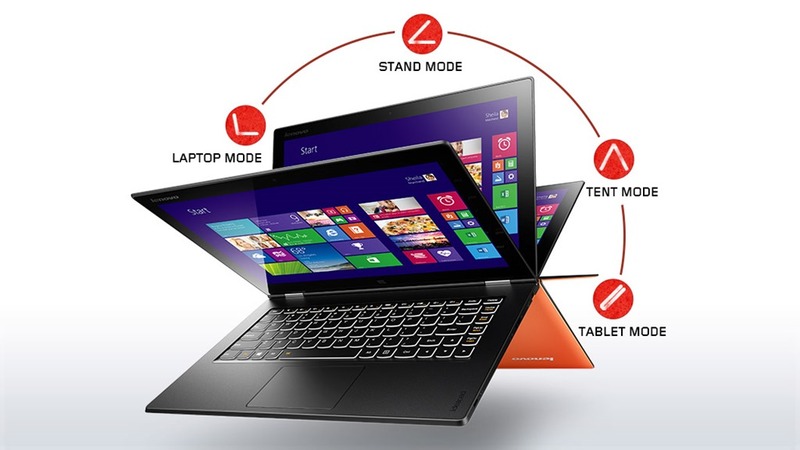 The applications can adapt to your tablet’s touchscreen input and scale to high resolution displays. For more information about the OnTime Management Suite, click here. For more about OnTime Dispatch, click here. In the field and on-the-go access to OnTime Management Suite and OnTime Dispatch may be also be achieved using Windows laptops and netbooks (see our System Requirements for details). OnTime users who require access to either OnTime Management Suite or OnTime Dispatch via a tablet that is not running Windows can make use of remote access tools from providers such as LogMeIn and GoToMyPC. These tools will allow you to interact with OnTime as it runs on your desktop computer by using your tablet and its touchscreen controls. As discussed in our last post about dimensional weight, OnTime delivery software provides the tools that your courier business needs to create and implement your flexible pricing structure. Like dimensional weight, OnTime’s Zone Lookup Tables give you deeper control over your pricing and allow further flexibility. When using zone based pricing in OnTime, Zone Lookup Tables can be used to offer complex rates that vary based on the zones involved. Create, manage, and adjust your Zone Lookup Tables in the OnTime Management Suite. Each cell in each Lookup Table represents the value used for the two zones labeling the corresponding column and row. You may fill individual cells in Zone Lookup Tables manually or by copy-and-pasting from your own rate sheets in Excel. You can also adjust all cells in in a Zone Lookup Table at once, based on a fixed percent or a flat amount. The values placed in Zone Lookup Tables can be included throughout your pricing structure as needed, ensuring that your prices are always accurate. Gain greater control over your business and its flexibility by using OnTime to manage and calculate your prices. Learn how to setup and use Zone Lookup Tables and OnTime’s other diverse pricing tools in the OnTime User Guide. Some shipments are best priced by distance, others by weight, and most by a combination of charges. Because of the virtually unlimited factors that can affect the cost of shipments, OnTime is as flexible as your pricing needs to be. In situations when both the weight and the volume of a shipment will affect the cost and pricing of that delivery, dimensional weight is commonly used to help calculate price. OnTime’s DIM Factor Generator (dimensional factor) and price modifiers make factoring dimensional weight into prices a painless process. 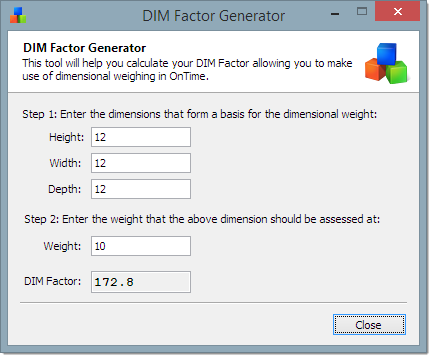 OnTime’s DIM Factor Generator can help you to automatically determine appropriate dimensional weight factors for your shipments. The DIM Factor provided by the generator can be used in overage type price modifiers, which can be included in your pricing structure. When that dimensional weight factor needs to be considered for your pricing, you can apply the appropriate price set to the order and OnTime will automatically calculate the accurate price, factoring in the shipment’s dimensional weight. The parameters that you set will determine why and how OnTime calculates prices, ensuring absolute accuracy. Whether offering price quotations or dispatching orders, your customers will be provided with the most accurate, efficient, and reliable pricing possible. Easy to set up and easier to use – OnTime smart courier software can help you to control your pricing structure and improve your delivery business. Contact us to find out more. When you use OnTime’s Web Site Applets, such as the Price Estimator Applet or the Tracking Applet, your customers can instantly access information about their orders with your company. With the new Log In Form applet, your customers will be able to log in to your OnTime Customer Web Portal directly from your website. This form will give your customers the fastest, most convenient access to your Web Portal, where they receive the best customer service. Instead of signing in from a separate application or page, customers will be able to log in from your website, wherever you place the form. 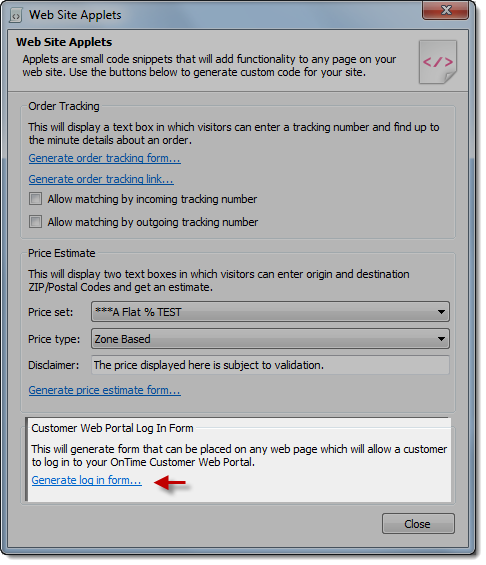 Place the Log In Form anywhere on your website by simply copy-and-pasting the code automatically generated by OnTime. To get that code, click on the Tools tab in OnTime Management Suite, then choose Web Site Applets. Click the link under Customer Web Portal Log In Form in the resulting window and OnTime will generate the necessary code. The OnTime Customer Web Portal and its Log In Form applet are included with Enterprise and higher subscription plans. Buy or upgrade your OnTime account to give your customers seamless service.